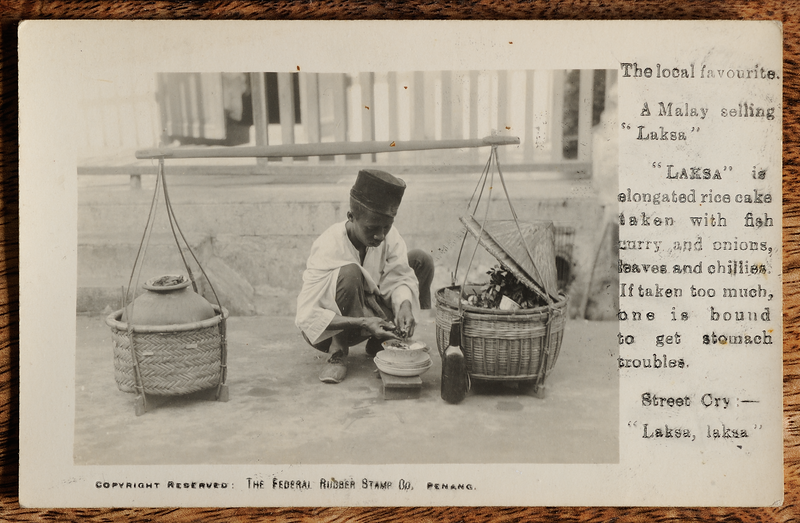 Penang's fabled street food, circa 1930. On the reverse is a written note: notice the hat worn by nearly all mohamadans. the malays call it sonko(k) or kopia(k). notice also the squatting position with heels flat on the ground. a posture common among all orientals. Penang island was one of the first to go. It was abandoned to the Japanese on 17 December 1941 after heavy bombing. Victory was so swift that two Japanese officials found themselves scrambling for their personal seals to mark the stamps before proper overprints could be made. 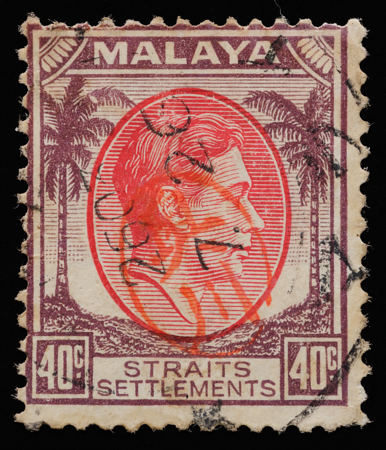 The only other instances of such seal use in Malaya were the Handa and Sunagawa seals in Kelantan, which had also capitulated early in the invasion. 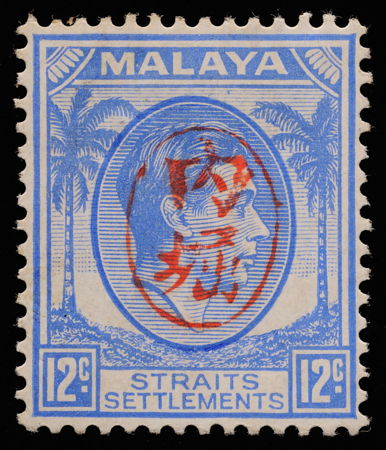 The Okugawa Seal, introduced on 30 March 1942, was the personal seal of Okugawa Akira, Chief Finance Officer of the Penang State Government (Cheah 2001). It is a mitomein, the least formal type of Japanese seal meant for everyday office use: an oval-shaped seal carrying only the family name. 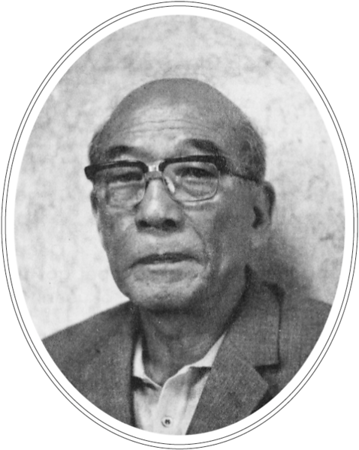 Miyazaki Masukan, Okugawa's superior in charge of general affairs of the government, made the decision to use the seal on-the-spot when consulted by Okugawa (Tomioka 1977). 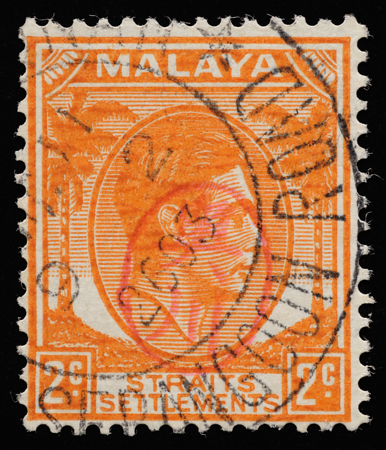 Stamps were overprinted at the Zaimuka (Finance Section) in Penang (Cheah 1976a). An obscure full-name seal was also used. There were three documented forms of the seal (Dewey 1965b, Tomioka 1977); the earliest one (above) was made of ivory, with its hallmark broken frame. Ivory had little practical advantage over less precious materials, but was used as a mark of high office (Taguchi 1964). 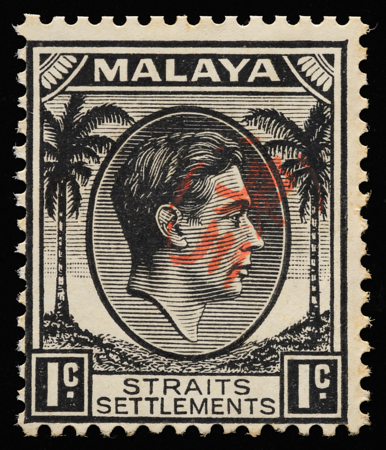 The author finds the stamp on the left particularly atmospheric, resembling a tribal face painting in the flag colour of imperial Japan. The differences in print characteristics on chalky versus rough paper are evident. When the ivory seal wore out from heavy use, two more (above, left–right in chronological order) were made locally from water buffalo horn (Tomioka 1977, Tsuchiya 1999). These forgeries of the second Okugawa Seal are the work of the same enterprise, featuring uncharacteristic pinkish ink and impeccable socked-on-the-nose cancellations are themselves forgeries (see Norris 1991, Proud 1992, Norris 1994, Wade 1997, Pain 1999, Robinson 2001, Steinbrüchel 2001, Murray Payne 2007, Cartwright 2008). Compared to the real overprint on the 40c above, the oblong part of the first character is much squatter and the curvature of the first stroke of the second character is different, among other deviations from the genuine seal. The $1 is by far the rarest Okugawa denomination; only 49 copies were overprinted with either the Okugawa or Uchibori (see below) seals, compared with over 200 of any other single denomination (Cheah 2000), making it an attractive candidate for forgers. 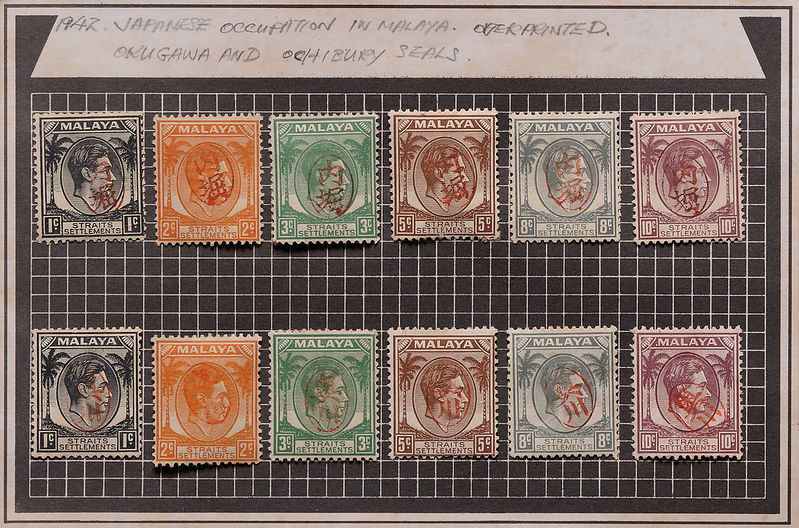 This example has a ghostly double overprint resembling the second form of the Okugawa Seal. 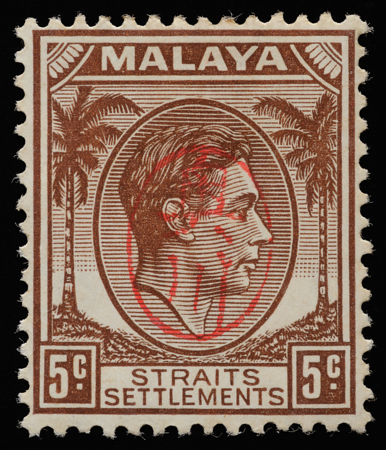 A suspicious feature is what appears to be a postmark typical of those used before the war, although pre-war datestamps continued into the early days of the Japanese occupation. The double overprint sensationalizes the stamp, causing distraction and confusion that impairs logical reasoning. 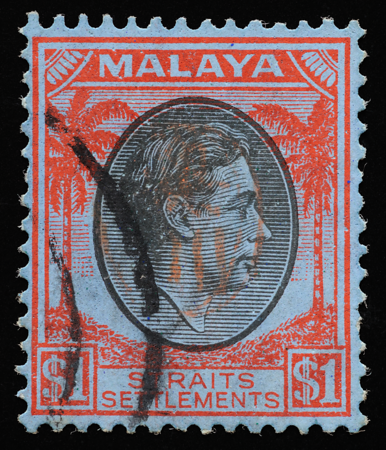 Objective examination will reveal that the overprint and postmark do not intersect although they appear to. 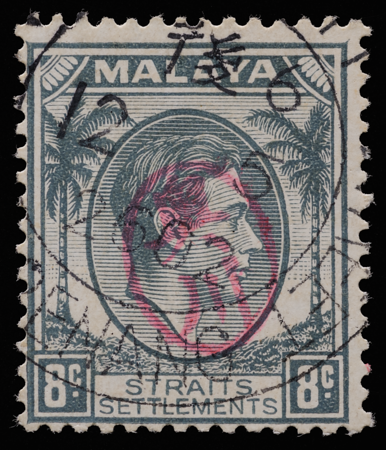 Indeed, the overprint avoids the postmark so skilfully as to be extremely unlikely by random chance, especially when a double overprint is involved. 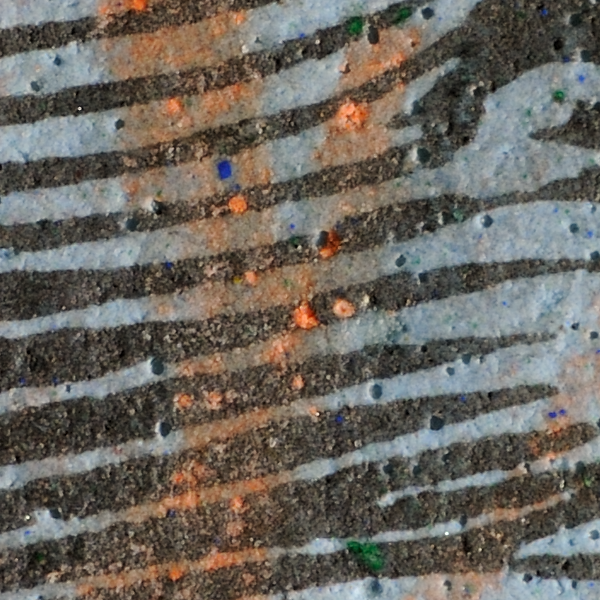 The colouring matter of the forged seal has clogged the craters of the paper coating. 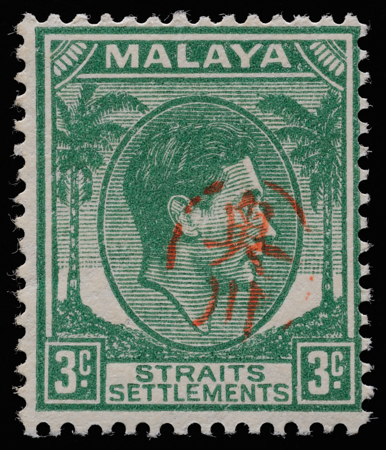 This looks as if a paste was smeared onto the stamp with a stiff brush or other implement slowly and deliberately, rather than vertically deposited using a chop. Such a process would also account for the lack of a boundary of accumulated ink that characterizes chop impressions. Alternatively, a chop could have been used. The paste would have been thick enough to fill up the craters, but it was subsequently eroded from the unsheltered surface of the stamp. This forged seal has dimensions closer to the second form of the Okugawa Seal, but with greater typographical affinity to the third. An experienced eye can immediately detect forgery in the macroscopic features of the characters and the unusual ink colour. In addition, the artist has tried too hard to impregnate the seal with fake irregularities, ending up with too many awkward pits and craters that remind the author of volcanic rock. I have encountered at least nine different forgeries of the Okugawa Seal; for some other examples see below and forged handstamps. Samsu is a wine made from fermented rice, with a very high alcohol content of about 60%. Due to its popularity in the early decades of the 20th century, illegal temporary distilleries were rampant, some deep in the jungle with tripwires and sentries to guard against the authorities (Mackay 2005). 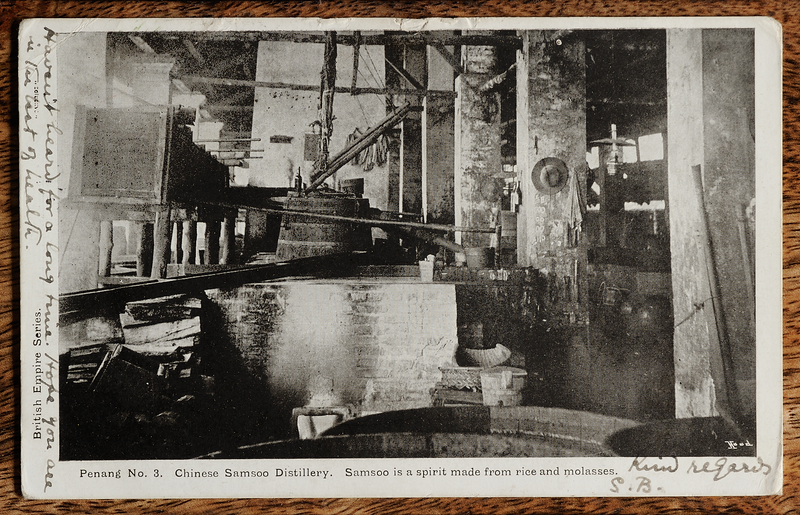 The postcard shows a legal distillery, much larger compared to the thatched huts hidden in the bush. Sometimes the wine contained excessive copper leached from the distilling apparatus, as reported by Cowap (1931). The handwriting on the border of the photograph reads, 'Haven't heard for a long time. Hope you are in the best of health.' Altogether not inappropriate, since samsu is often steeped with reptiles, insects and fruit to produce a medicated wine (Mackay 2005). As his seals could hardly keep up with demand (Tsuchiya 2001a), Okugawa borrowed the seal of his 27-year-old cashier Uchibori Nobuharu, which had been made in a Chinese shop using imitation boxwood (Tomioka 1977). The use of this seal was also authorized by Miyazaki (Tomioka 1977). Uchibori is notoriously prone to misspelling by philatelists as Ichiburi, Itchiburi, Itchibori, Ochiburi, Ochuburi or Uchiburi as listed by Japanese Philately (2000, vol. 55), and even Ochibury as seen below and in a 1973 Robson Lowe auction catalogue. Uchibori's name is engraved with thicker, more calligraphic 'brush strokes' than Okugawa. A miniature encapsulation of clashing civilizations from opposite ends of the earth, emanating the mystic beauty of nested ovals and the ancient art of the east Asian seal. The Uchibori seal should be smaller than the Okugawa seal as Mr Uchibori was junior in appointment, but interestingly his seal is actually slightly bigger. 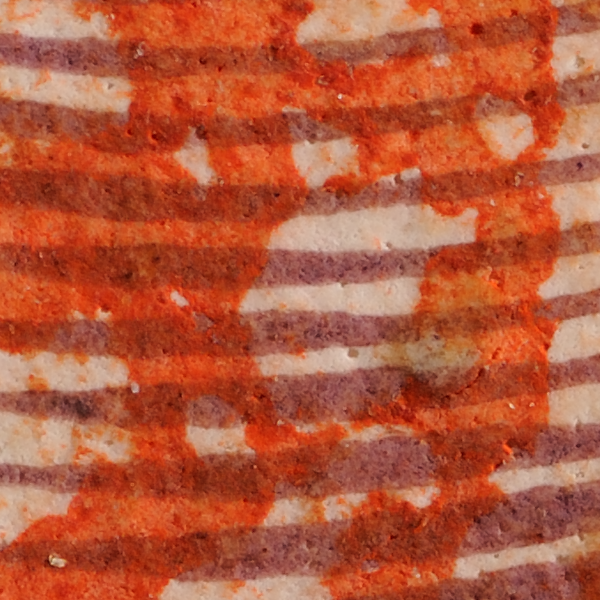 Uchibori Seal doubled and inverted in an oily ink. The reader may notice that this ink superficially resembles that on the Okugawa forgery on the $1 above, but there is no chalk-pit deposition here and the edges of the ink are more distinct. In Japanese correspondence, one traditionally applies his seal upside down on a document when he completely disagrees with the contents. 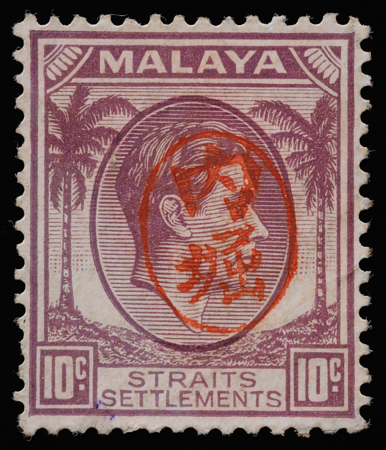 Although Dewey (1965b) reported that inverted Uchibori Seals had not been encountered on stamps and warned of the existence of forged inverted or double overprints, another philatelist with recognized expertise in this area has communicated to the author that genuine examples of these are in fact not unknown. It could also have been obtained through bribery of postal officials, as was often done with hand chops. Like the forged Okugawa Seal on the 5c presented earlier, this one has the consistency of 'volcanic rock' that may have been a result of human intervention or the use of a porous material for casting the fake seal. The forger has managed to imitate the characters quite closely, but tried just a little too hard to make it look real. 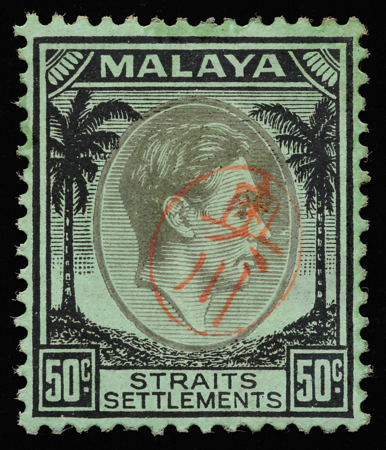 Magnification of the overprint showing the 'volcanic rock' syndrome. Cheah (1976a) reported the existence of a second form of the Uchibori Seal on cover, but Uchibori himself subsequently asserted that only one form of his seal ever existed (Tomioka 1977). 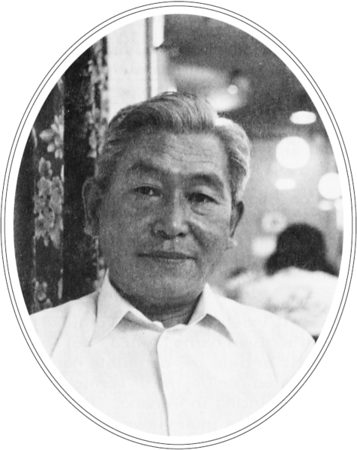 Some argue that Okugawa and Uchibori themselves might have forgotten the details by the time they were interviewed three decades after the war, or indeed had not even been aware of the situation on the ground, since the actual handling of the seals was undertaken by their secretaries. Realistic-looking but typographically erroneous, this calligraphically sophisticated opus by a prolific forger employs an ink giving the consistency of dried blood. One forger even produced an outrageous hybrid seal of a character pair that did not exist (Gallatly 1959b). Gallatly (1962b) documents the real seals and offers a guide to their identification. 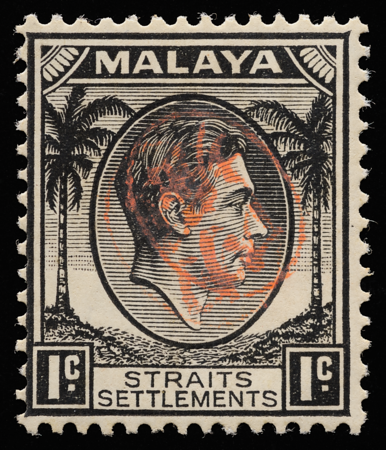 Despite extensive research over the years, the Penang seals remain steeped in mystery and intrigue. All the seals have been reported lost (Tomioka 1977, Tsuchiya 1999), but there is no proof of their destruction. Such is the fascinating history involving two humble civil servants who never in their wildest dreams foresaw that they would become their country's global ambassadors. 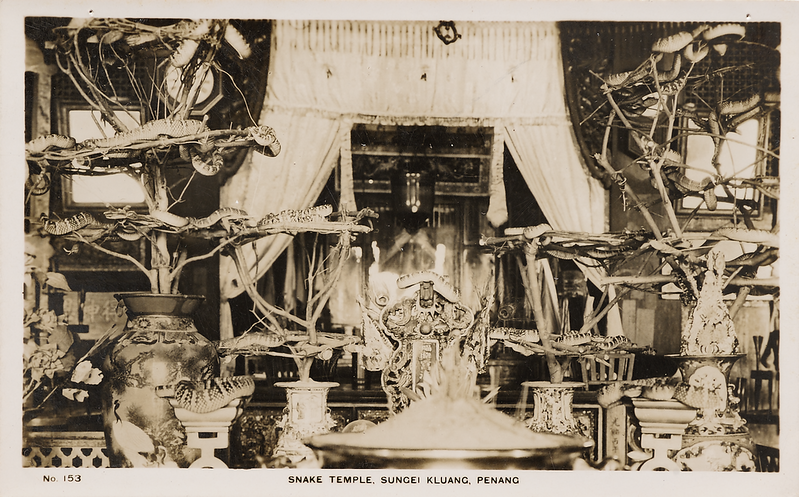 Venomous serpents in the Snake Temple (1850) in Penang. The snakes are of the species Tropidolaemus wagleri, a pit viper native to southeast Asia.